No, this photograph was not taken in the Cairns Botanic Gardens. It was taken at Isabella State School and the event was their annual fete. Some people chase storms, others chase eclipses. 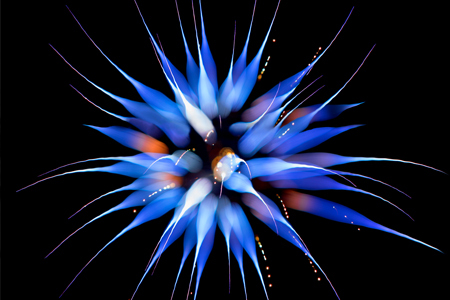 Cairns based photographer, Shaz Spannenburg chases fireworks. Over the last 3 years, there have been few fireworks displays in Cairns that Shaz has not attended. And she’s liable to hop on a plane to Brisbane if she thinks an event is going to give a good bloom of pyrotechnics for her picking. Having perfected her sleight-of-hand photographic techniques, Shaz Spannenburg magically transforms split-second moments in the sky into stunning floral images that can bend your imagination.